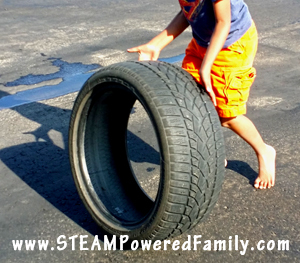 Car tires can provide a wonderful opportunity for strength building, coordination challenges, engineering challenges, gross motor practice, and sensory inputs (proprioception and vestibular in particular) in older children. The best part is that you can usually get car tires for free and you can get them in different sizes to change up the challenge level! 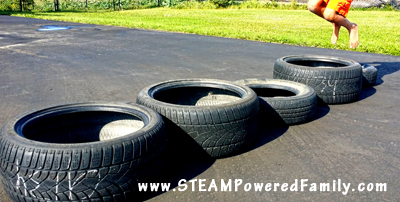 A car tire obstacle course is great fun and it can be cleaned up between uses. My boys are obsessed with the show American Ninja Warrior. 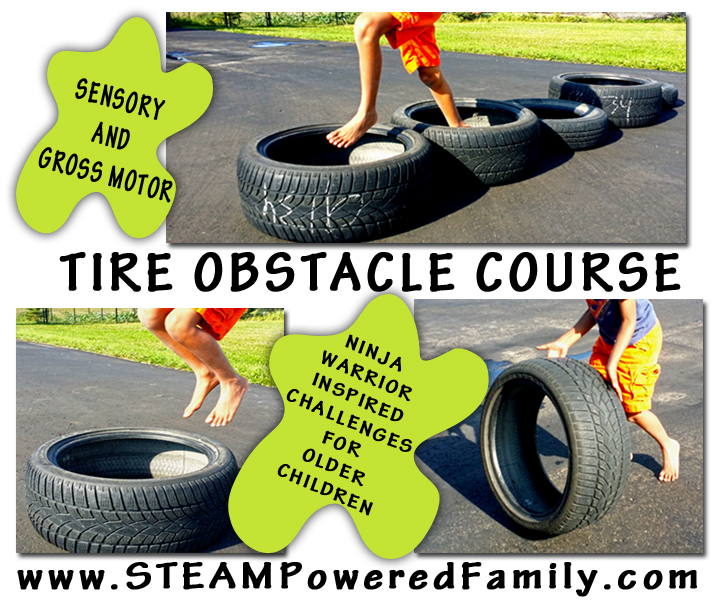 They love the idea of tackling the obstacles and beating the challenges so we have come up with our own Ninja Warrior inspired obstacles and challenges using old car tires. We always have so many tires kicking around here. It comes with racing cars and being generally a car family, but the good news is that tires can be easily found for free! In many communities they accept used tires at their recycle centres. At ours you simply drive in, look through the tires and pick the ones you want. You can also ask at local tire shops or just ask your friends for old tires. When picking your tires there are lots of different sizes. We have everything from dirt bike tires (great for smaller kids), to wide sports tires now the boys are bigger and need more challenge. I recommend having a variety of tires on hand if you can as you may find different sizes are needed for different activities. Remember you want rimless tires! Depending on your child and where you are practicing you may want to use a helmet and knee/elbow pads and wrist guards while working with tires. 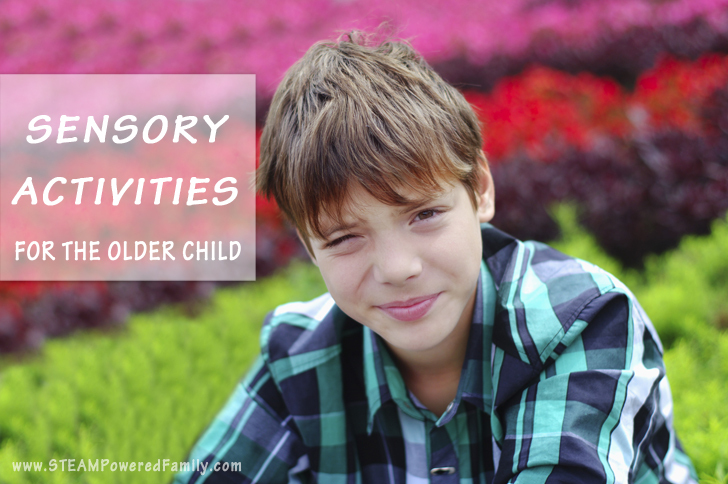 You should also consult your child’s doctor or occupational therapist if required. It really is about knowing your child best and keeping their safety first. The tire should also not be so big that your child can’t handle getting bumped into by the tire or lift it. Always use adult supervision and common sense. Tires are great because they provide wonderful sensory inputs for the vestibular and proprioception systems. Plus working with them builds strength and coordination. 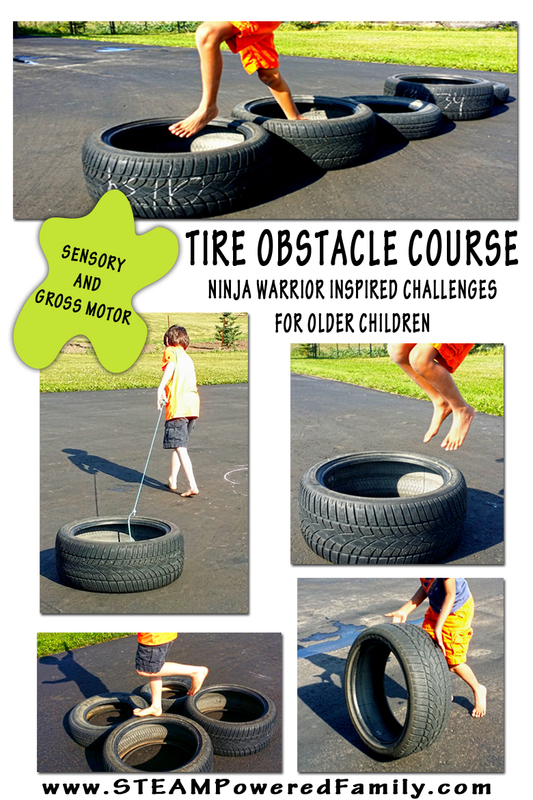 Here are a few of our favourite ways to work with tires to set up a Ninja Warrior style obstacle course and challenge. I’m sure I can’t be the only one with Ninja Warrior obsessed kids! Roll the tire – This is not as easy as it looks. Those tires wobble and the faster you go the greater the challenge. Roll the tire up and down hills – Take the rolling challenge up a notch by incorporating a hill. High Stepping – Set up a series of tires, either side by side or in a row, and have the child high step through them. Side by side is better for taller children, shorter children should start out with the tires in a straight line. 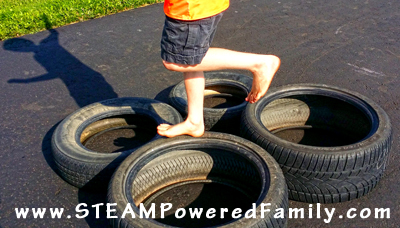 Side Stepping/Jumping – Have the child stand beside the tire, then side step into the middle of the tire, then back out. For more advanced kids have them jump or hop sideways in and out of the tire. Jumping – Start simple by setting one tire on the ground. Have the child jump into the middle of the tire, then jump out again. If that is easy, set up a row of tires and have the child stand inside one tire, now jump into the next tire. Bunny Hops – The same as jumping but keep the feet together and bunny hop through a series of tires. Lifting – Have the child practice lifting and carrying the tire. Stacking – If lifting is easy, have them try stacking the tires. 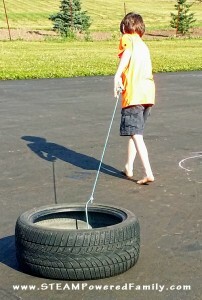 Pulling – Tie a rope around the tire and have the child drag it around. 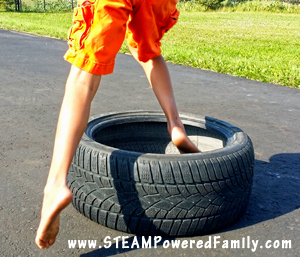 Balance – With the tire flat on the ground have the child stand on the tire, one foot on each side. Hold their hand and use caution as the tire will easily tip up as they learn how to maintain their balance. Balance Steps – Setting up a series of tires have the child walk or run across the sidewalls keeping their balance and not letting the tires flip. Crawl – Setting the tire up have the kids crawl through the middle. Flipping – Flip the tires. Starting with the tire flat on the ground, have the child pick it up and flip it over. Repeat! Race! 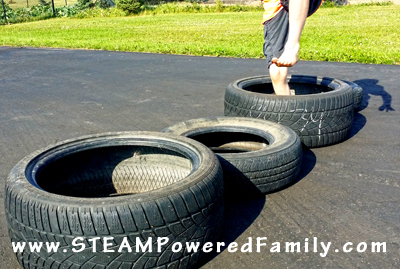 – This is something Preston loves to do, start the tire rolling and race it across our yard or driveway. With all of these you can do them individually or make them head to head challenges or timed challenges. 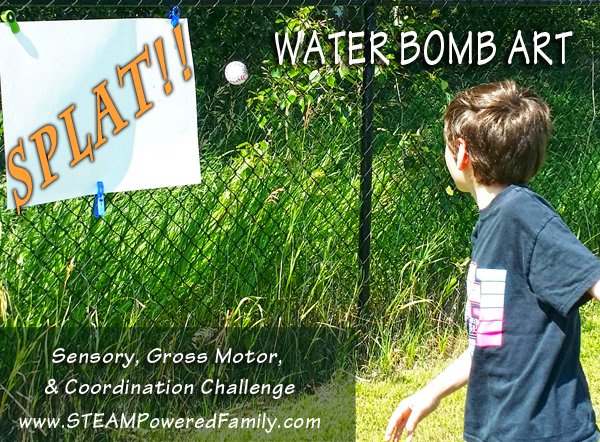 It’s all about figuring out the most fun for your kids! 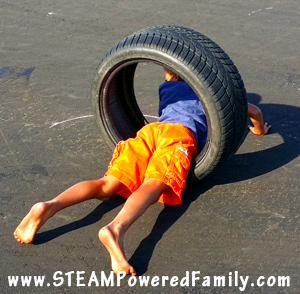 There are so many cool things you can do with tires to help meet the sensory needs of older kids. And the best part is you can do it for free! Looking for more fantastic ideas for your old tires? 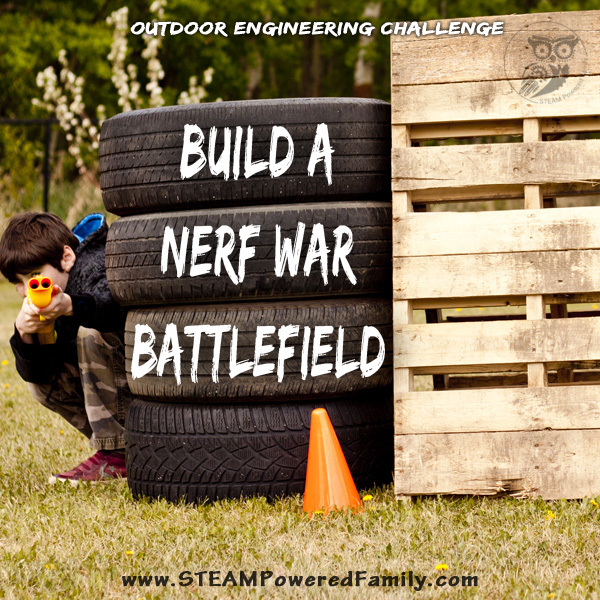 How about building a Nerf War Battlezone? We did the same thing!!! I never thought about it being helpful in any way except getting their energy out. LOL 🙂 But I like the way you break it down!